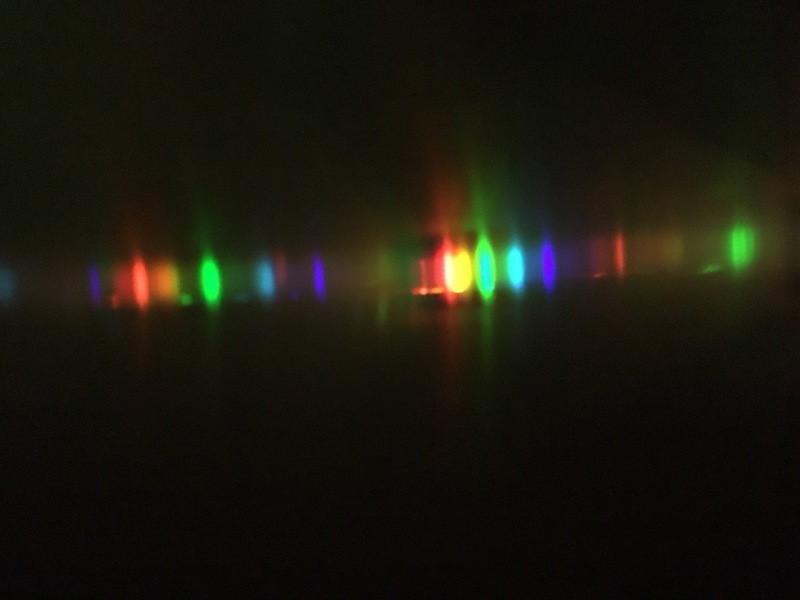 Make a spectroscope with a DVD, and use it to look at the spectra of various light bulbs and the sun. 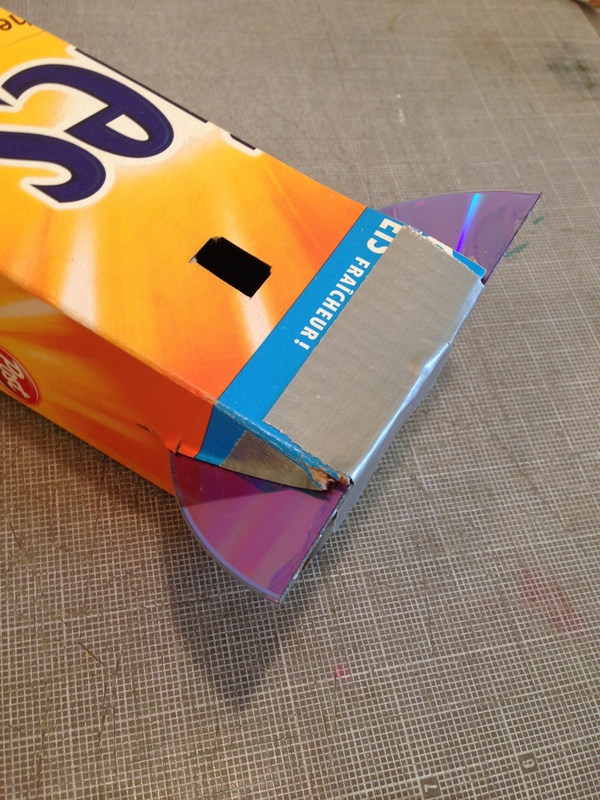 Draw panels so that the cereal box can be folded into a square tube, using the folds already present (side panels of cereal box may become one or two sides of the spectroscope). 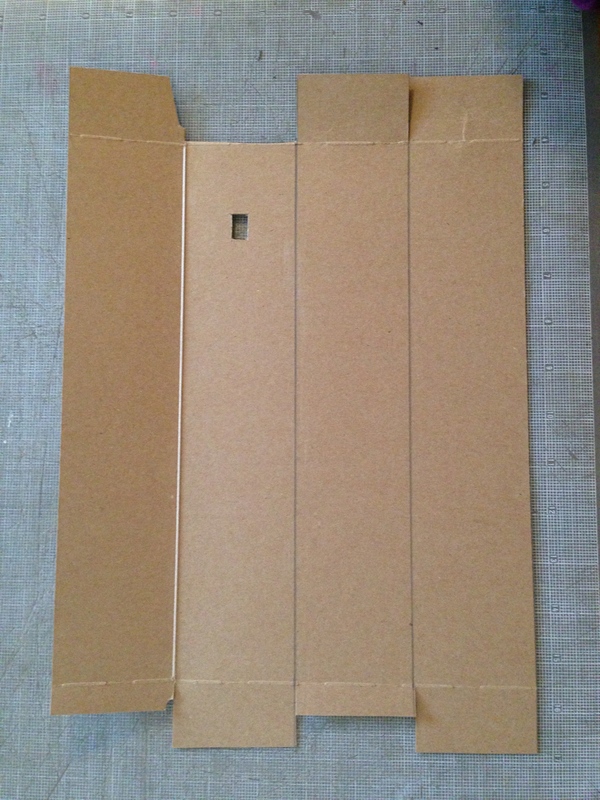 Score folding lines, on the outside of the fold (printed side of the box) all the way across the box. (The brown inside of the box will end up on the inside of the tube, as it is darker and will reflect less light.) Cut all the way through the cardboard when you reach the end tabs. Cut end tabs at one end of the cereal box, so that they can fold down to close the end (the length depends on the size of the cereal box). Cut off one of the middle tabs, and on same panel, cut a hole (4-5.5cm from end and 1cm wide). This viewing hole is on “the top” of the spectroscope. Cut the tabs at the other end of the cereal box, so that they fold in to make a narrow slit, 1mm wide, across the box. 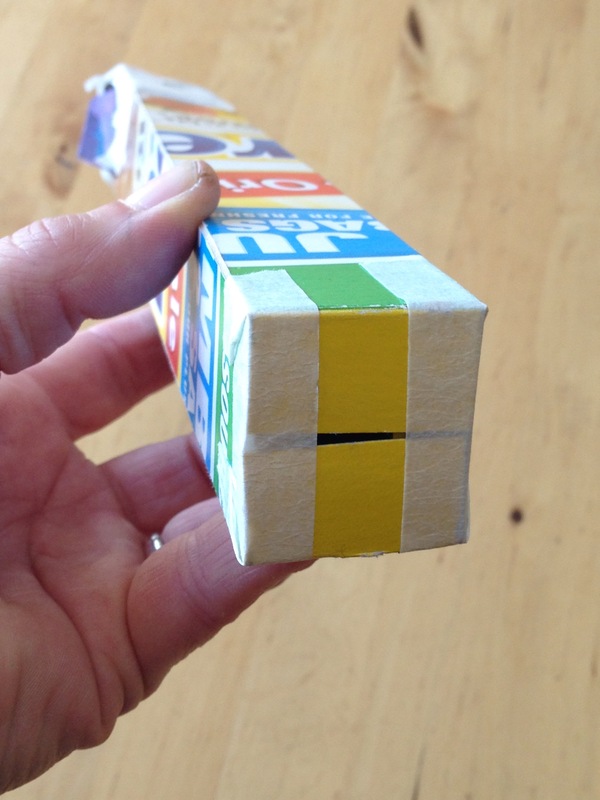 Fold the cardboard into a tube and tape the long side with duct tape or masking tape. 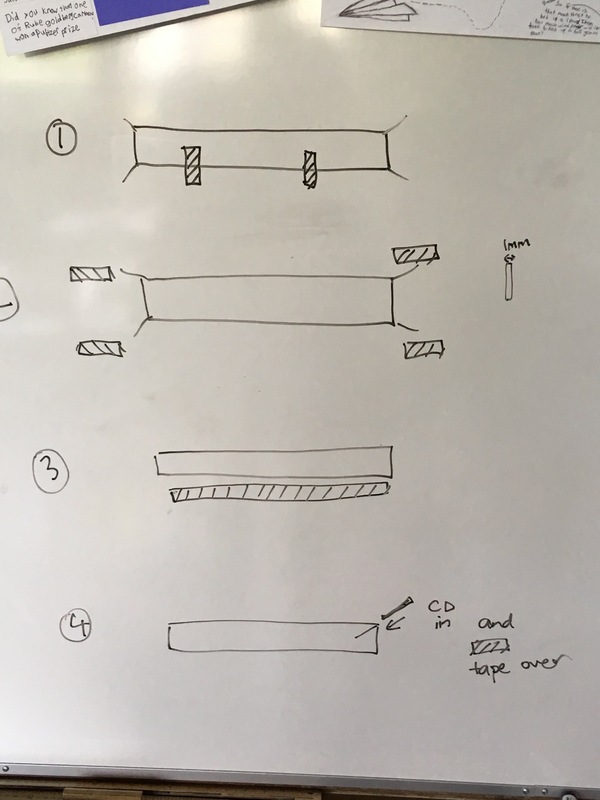 It can be easier to put short pieces of tape in a couple of places first to align the edges before adding the long strip. Tape the flaps closed, leaving the top edge open near the viewing hole. 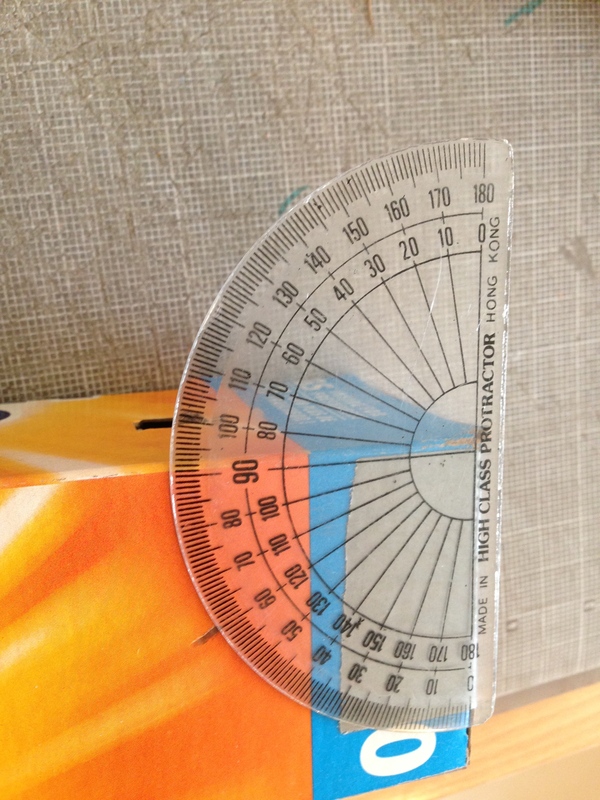 From the opening near the viewing hole, measure a 60 degree angle from the vertical, on both sides, and mark a line at this angle in pencil. Cut slits 4cm long along this line. Alternatively, these slits can be cut in the cardboard ahead of time for the students. Cut a DVD in half (or quarters with smaller cereal boxes) with sharp scissors (less likely that the layers will separate than trying to snap it). Insert the DVD piece into the 60 degree slit, making sure the recordable side (with the grooves) is up. Check the spectrum is visible before taping the DVD in place: point the slit directly at a light source, then look through the hole at the reflection of the light off the DVD. 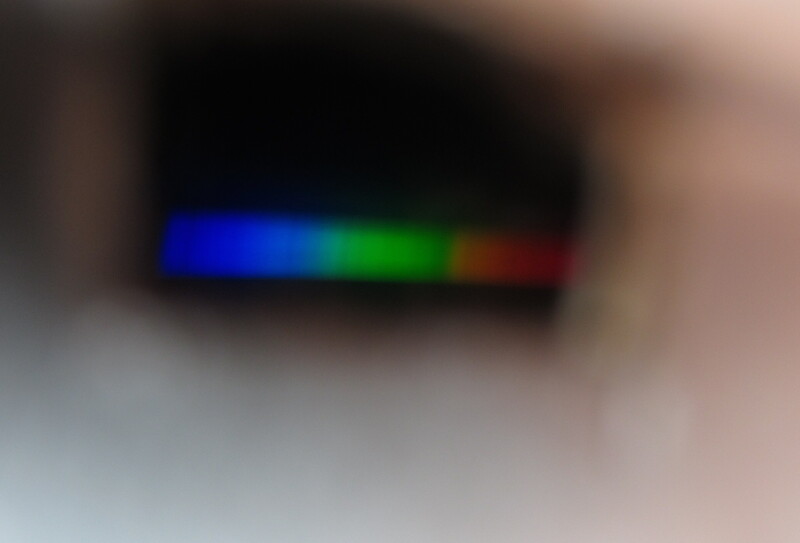 The spectroscope separates the colours of light. They are seen as a "spectrum". Students can look at various bulbs in the classroom to see what kinds of spectra they have. Or field trip: visit the local stores and look at their various lights through the spectroscope, to find out what kind they are (a supermarket has a god selection of lights with the fridges, displays and overhead lighting. Primaries can look for different kinds of spectra (broken or continuous) and the colours (see primary worksheet attached). Intermediates can be challenged to find their own patterns in the spectra. 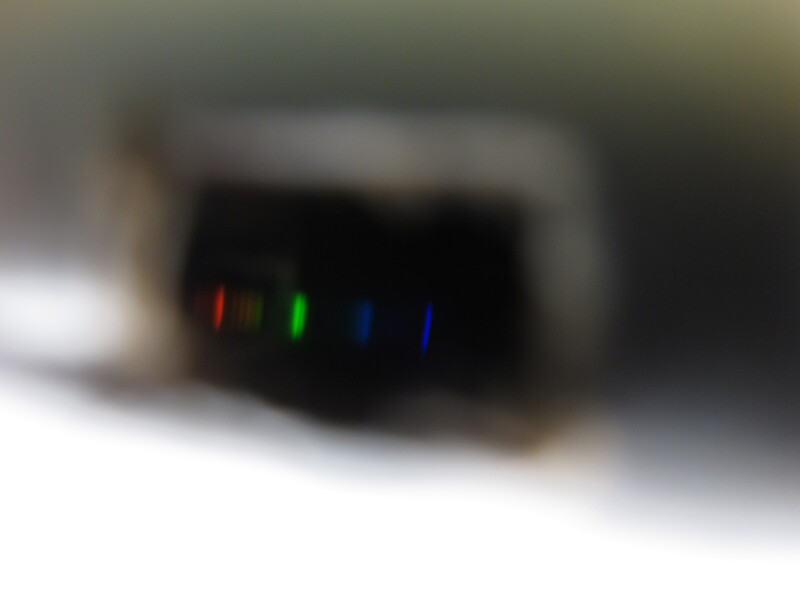 Viewing an incandescent or LED bulb with the spectroscope will show a continuous spectrum - the colours are all smeared together. Every wavelength of light is emitted by these bulbs. See image 8. LED bulbs of one colour will have continuous spectra within these colours. A fluorescent bulb will show distinct lines of colour - a broken spectrum. The colour of the lines present depend on the gases inside the fluorescent bulb (often mercury and argon). The lines are made as the different gases emit light of certain wavelengths. See image 9. A candle will give a continuous spectrum. Throw a little salt in the candle and a yellow line will flare up. The sodium in the salt emits light of this yellow wavelength when it is excited (by the heat of the candle). As the sodium atoms lose energy again they emit it as light of this particular wavelength. Take the students outside to view the sun's spectrum with their spectroscope. DO NOT allow students to look directly at the sun. Ideally they point at light clouds in the other direction from the sun, or the blue sky. 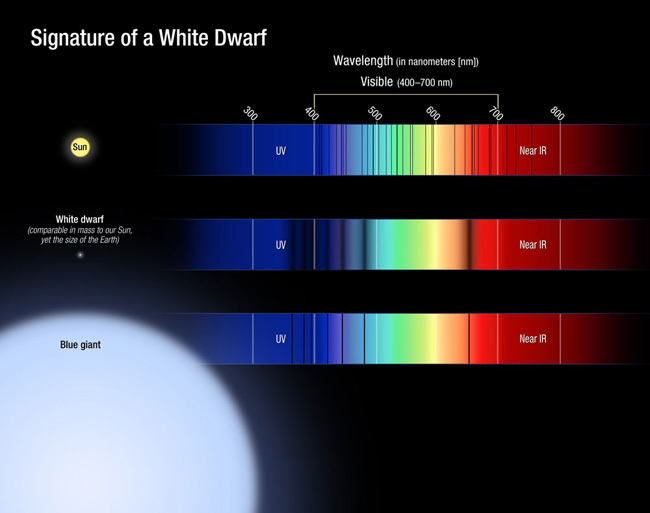 They will see that the sun's light makes a continuous spectrum, so emits all wavelengths of light. If they are lucky they will see Fraunhofer lines - dark lines crossing the spectrum that are the result of gases in the sun (and also the earth's atmosphere) absorbing certain frequencies of light. 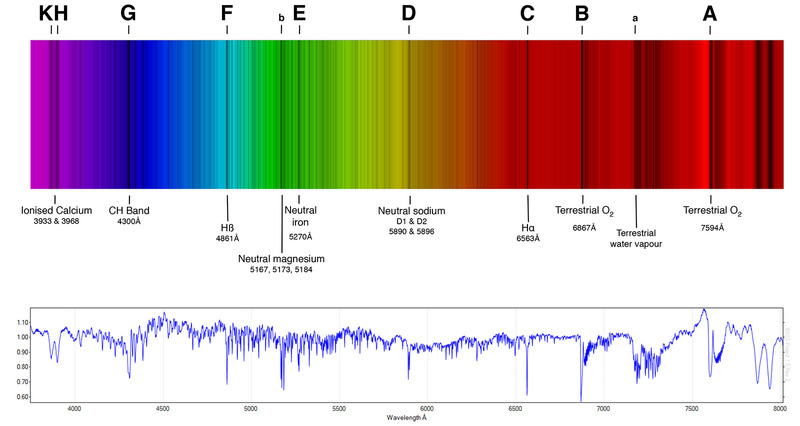 Try links for images of Fraunhofer lines in sun's spectrum: https://media1.britannica.com/eb-media/02/96902-004-856CCB82.jpg or http://jazzistentialism.com/blog/wp-content/uploads/2014/05/fraunhoferli... Scientists look at the position of these dark lines to deduce what molecules our sun is made of. Ask students where they see the lines and tell them what molecules in the sun's atmosphere they are detecting. The lines also tell them how fast and in what direction the stars are moving, by how red-shifted the lines are. Red-shift image try http://en.wikipedia.org/wiki/Doppler_effect#mediaviewer/File:Redshift.svg. See Doppler effect activity to model how red-shift works using sound. Other spectroscope activities to try: https://publiclab.org/wiki/spectrometry-activities. A spectroscope with half the diameter tube i.e. one side of cereal box makes two sides of the spectroscope. This model does not need the slit - cut the end flaps so that they make a small slit between them and this works fine. DO NOT look at the sun with this. 3 hrs to make one class of spectroscopes.